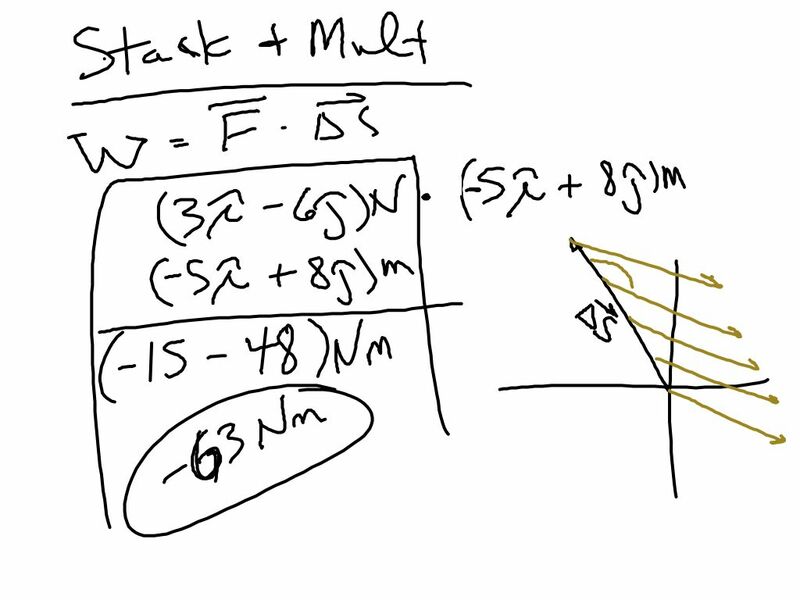 PhySP18SS6.6.12: From sheet 6.13: This was the bit on stack and mult. When you are dotting a force vector with a displacement vector and they are given in terms of I roooooof and J rooooof, all you have to do is stack them and multiply the i component of the froce by the i component of the displacement. that value will NOT have a direction since i dot i = 1 since i dot i = (1)(1)(cos0). The same holds true for j dot j. Therefore the direction gets dotted away and you end up with a scalar (the i components multiplied together added to the j components multiplied together.